Who else gets excited about vegan enchiladas? 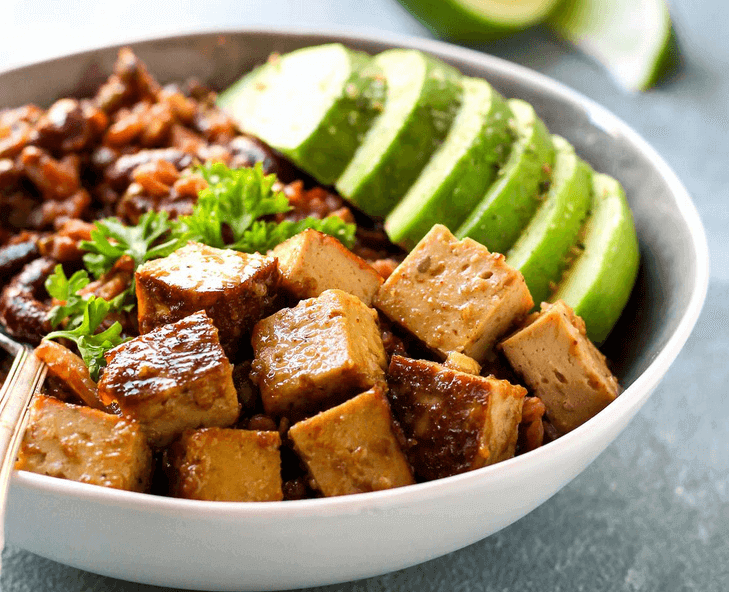 This Vegan Enchilada Recipe features spicy tofu and fresh avocado. It’s a vegan Mexican inspired dish to get excited about. My favorite part of this recipe is you can make it in 30 minutes or less. I could write a book on enchiladas. They are a passion of mine. I have always loved Mexican food and inspired dishes. Vegan enchiladas rank very high on that list. There is an artform in how to prepare them all the way to how you cook them. And there are many different variations. Pan cooked enchiladas, baked enchiladas, and even fire roasted enchiladas are great. I have tried them all. How you cook them makes the difference as well as the ingredients. A perfect enchilada filling is key to having a final dish you will want to devour time and time again. 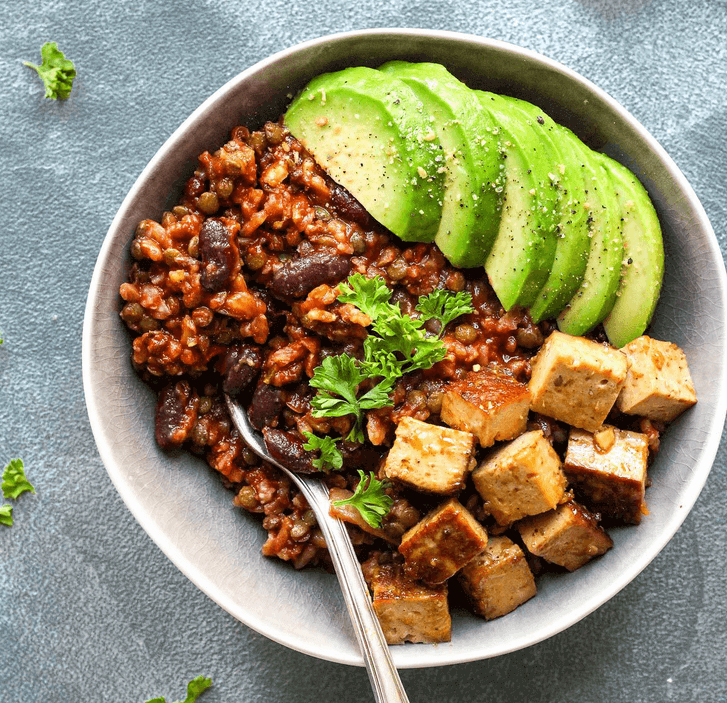 This easy vegan recipe accomplishes all of those things. 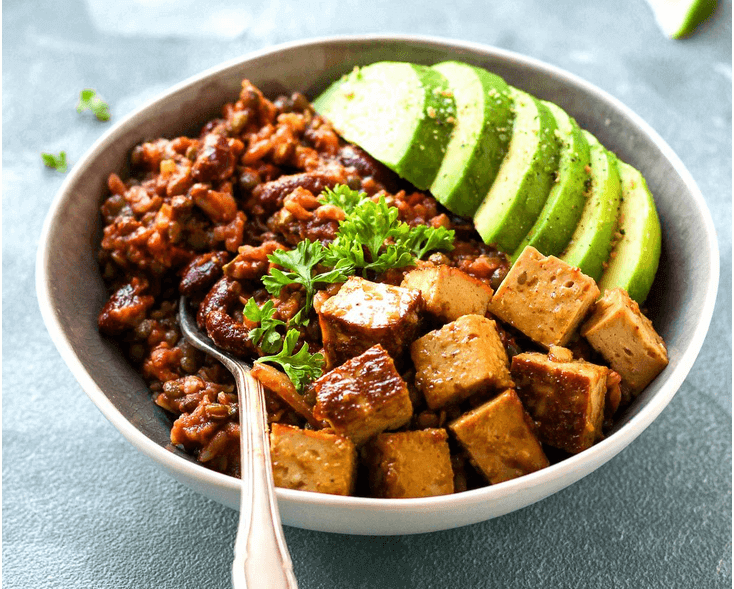 The key to this vegan enchilada filling is those amazing lentils, rice and beans. What a layer of healthy filling ingredients. And it’s really quick and easy to prepare so you won’t have to wait all day to eat or serve your guest. Fast, delicious, vegan food is the order of the day. This recipe really delivers. In 30 minutes or less. Let’s don’t leave out the spicy tofu though. It really delivers a delicious flavor kick to this yummy enchilada bowl. It rounds out the other flavors like rice and beans very well. The secret is the tofu marinade based around tamari, chili powder, and maple syrup. It’s a spicy flavor with just a hint of sweetness. You will love it. Did we mention you get a whopping 21 grams of protein in this dish? And that’s per serving, not the entire recipe. Full of plants is the creator of this amazing vegan Mexican recipe and beautiful photos. You can learn how to make this vegan enchilada recipe by clicking here.